Blue Jays are beautiful blue birds perhaps best known for their aggressive and loud behavior. They are frequently seen stealing food from other birds, and protecting their own nest by attacking large predators. Their scientific name, "Cyanocitta cristata" means blue, chattering bird. Their calls sound like a "jay jay" or "queeble." They are also good at mimicking other bird's calls. Green - year round residence. Yellow - breeding only. Blue - winter only. 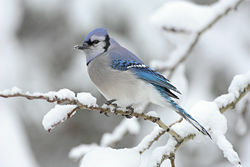 The diet of a Blue Jay consists of nuts, fruits, insects, mice, frogs, and other bird's eggs. To some people this may seem unacceptable, but it benefits the environment by keeping bird and insect populations from becoming too large. They are omnivorous, meaning they eat both plants and animals. An estimated 24% of their diet is other animals, and 76% is organic matter. They like to scare other animals into giving them their food and use their beaks to crack open nut shells. Most of them do not migrate, but stay in the same area all year round. They live in the Gulf Coast and Eastern United States all the way up to Southern Canada. They are slowly moving westward as well. They live more towards the edges of deciduous and coniferous forests or in urban areas such as city parks. They love to reside in towns and cities where a quantity of large nut producing trees can be found. In Missouri, they have estimated a 2% increase of Blue Jays every year. Blue Jay The Central Pets Educational Foundation and its licensors, November 30, 2008. About the Blue Jay ScanSoft Trading Company Ltd., November 30, 2008. Blue Jay Enchanted Learning, 1999-2008. Cyanocitta cristata Jake Frysinger, The Regents of the University of Michigan and its licensors,1995-2008. Blue Jay Habits Wild-Bird-Watching, 2007-2008. Blue Jay University of Minnesota Duluth, 1999-2008. Blue Jay Cornell Lab of Ornithology,2003. Blue Jay Aspen Song™ Wild Bird Food, 2008. This page was last modified on 16 March 2011, at 14:07.